To see any pure math lecture on TED is exciting. Why are these things so rare? A recent talk by Marcus du Sautoy, Symmetry, reality's riddle, is now availalbe here. Marcus du Sautoy is a prolific mathematics expositor, and was recently appointed as Oxford's Simonyi professor of the public understanding of science (a post he takes over from Richard Dawkins). I enjoyed his Story of Maths on BBC, and also the one book of his that I've read, The Music of the Primes. His talk touches on topics that he, reportedly, explores more fully in his new book, Finding Moonshine. 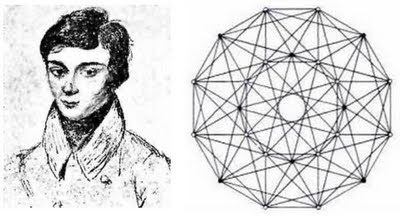 For many, the story of Galois that du Sautoy used to launch his talk will be new, but to me it seems to be a tale that mathematics popularizers have stretched a little thin. The story of Galois's duel must rank along side the story of Gauss's defiance of his school master as the top two most popular mathematical biographical capsules of all time. It would be great if someone would go through the popular re-tellings of the Galois story the way that Brian Hayes has for the Gauss story, to see how different authors have embellished and expanded it (perhaps someone has?). One thing that I found striking and appropriate about du Sautoy's talk is that although it is about group theory it never mentions the phrase "group theory," instead it always stays focused on the motivating notion of symmetry. The mathiest parts of the talk were the examples drawn from the wallpaper groups of Spain's Alhambra fortress (which, along with Galois's duel, are also frequently mentioned in popular literature on symmetry). Watching this TED lecture made me feel a little depressed that I haven't yet taken the time to really start working through the beautiful and quirky book The Symmetries of Things, by John Conway, Heidi Burgiel, and Chaim Goodman-Strauss - definitely the next place to go if you are inspired by the lecture.